During the Second World war, Quorn House on Meeting Street was used as a nursing station. Many local women and girls worked there. 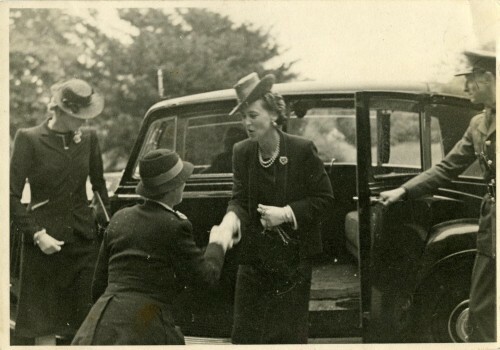 This picture shows the Princess Marina, the Duchess of Kent arriving on a visit to Quorn House and getting out of her car outside of the front door. Left to right: Lady in Waiting, Lady Paynter (Red Cross Director at Leicester), Princess Marina, the Duchess of Kent. Sheila Brewer recalls: “She wore a navy blue suit and a very RED hat! She looked beautiful and was so gracious”. Sheila was in the Red Cross and worked at Quorn House prior to joining the forces.